The team at The Old Quay House are loving the new series of Poldark, and like many other fans, are being reminded how beautiful Cornwall is. We have been chatting to a friend of the hotel, Katy Austin, who has been an extra for the series. She has been kind enough to answer a few of our questions about what was involved. Where are you from in Cornwall? I currently live just outside Port Isaac in a lovely country cottage. My friend’s joke that I walk out of my front door onto the set of Doc Martin, it is very picturesque. My family live on a smallholding near Nanstallon (near Bodmin) which is where I grew up. Please tell us a little about how you got involved in the Poldark series? My casting agent put me forward for Poldark and I was selected. It was great how they used many local residents to be supporting artists. Local actress Gracee O’Brien was cast for the role of Jinny Martin Carter. Some of my friends took part in the auditions for the part of Demelza but were unsuccessful. Having seen Eleanor Tomlinson in action, I knew she was a fantastic choice for the role. I play a miner’s wife. She is present in several scenes including the shipwreck beach scenes where the locals gather at the beach to seize the ‘booty’ which washes up on the shore. She is also in some of the scenes at Ross Poldark’s Wheal Leisure mine as well as attending the wedding party for Jinny and Jim. Many of the women involved in the filming were cast either as miners wives or Bal maidens. Whilst life was tough for the majority of people in the era in which Poldark was set, it was evident that life as a miner’s wife was easier than that of a Bal maiden, who worked as a manual labourer in the mines. Are you a trained actress? My day job is in marketing for a company in Truro. I have never undertaken any training in acting. I was very shy growing up and I remember drama at school being my worst nightmare. Acting is not something I would ever have gone out of my way to be involved with, but whilst running some errands in Truro on my lunch break a couple of years ago, a casting agent stopped me and asked if I would like to go on her books for extra work. I decided to say yes as I am always keen to try something new. I think that the things that take you out of your comfort zone the most can end up being the most rewarding. I started doing extra work for a range of TV series and films made in the local area including Doc Martin and the German Rosamunde Pilcher series. I built up my confidence and started doing the odd small part or acting as a body double. When it came to being asked to take part in Poldark it was an easy decision. When and where did the filming take place? The filming for the Poldark series took place in June and July last year. I was involved in the filming of scenes in three main locations. As a miner’s wife the majority of the scenes were at Ross Poldark’s mine filmed at Wheal Owles, near Botallack. I also took part in the shipwreck scene filmed at Church Cove, Gunwalloe as well as Jim and Jinny’s wedding party, filmed on Bodmin Moor. All locations were incredibly fitting for the scenes and were very atmospheric. We were also very lucky with the weather and had a misty morning for the Bodmin Moor scenes, a dark and stormy day for the shipwreck scene and beautiful clear sunny days for the scenes at the mine. I think Poldark really showcases what a beautiful county Cornwall is. Even I was blown away by the scenery and I am a local who gets to enjoy Cornwall every day. What did the filming involve? The filming involved arriving very early at the unit base for costume, hair and make-up. This would take a long time as there were so many people to get ready for the day. We would then get mini buses over to the filming location. Filming would normally take as long as daylight allowed. The filming would often be very repetitive as for each scene there would be numerous takes both to get the scene perfect, to film from many different angles, as well as to capture both the actors dialogue and background noise. Sometimes it would be as late as midnight when I got home from a day’s filming. Let’s just say there were a few late night McDonald’s stops on the way home involved! Had you watched the original TV series or read the books before filming started? Before I took part in Poldark I hadn’t watched the series or read any of the books. I found this to be true for many of the younger generation of extras and actors. I have heard my parents and grandma talking about the original series and have since read up on how popular it was at the time. I recently purchased the first two books in the series (Ross Poldark and Demelza) which I am reading in conjunction with watching the series. How big was the team involved in the filming? The cast were really friendly and approachable. It was nice to see them interact with the other actors and extras and this really helped to make the long days filming more fun. Aiden Turner who plays Ross Poldark would sometimes be off in his own world learning lines or doing a few press ups between takes. There was a large crew involved in the filming which was needed to coordinate so many actors, extras and even the animals used. The attention to detail for the set, costume and make-up was incredible. The make-up artists were constantly coming along to ‘dirty’ us all up even to the point of blackening teeth for those of us whose teeth were too white. Myself and another supporting actress shared lifts home and although we were able to get back into our normal clothes, we still had really grubby faces and brown teeth which resulted in a few funny looks from members of the public! Was it how you expected and did you enjoy the experience? You never know quite what to expect when walking onto the set of a film or series and each one is different. I really enjoyed the whole process, from all the people I met, to the fantastic locations and getting to see the main actors and actresses in action. Also, what girl doesn’t like a good excuse to play dress up or be up close to Ross Poldark himself for that matter! The days of filming were very long and tiring but the excitement and atmosphere were enough to keep everyone going. You really do form a close bond with others that you film with as you spend long periods of time together which can be quite intense. As a keen horse rider many of my stand out moments involved the horses that were used for the filming. I got to ride in a horse and cart to arrive at one of the wedding party scenes which was a fantastic experience. Also being in close quarters to Aiden galloping past on the beautiful black horse Seamus was a pretty spectacular sight. 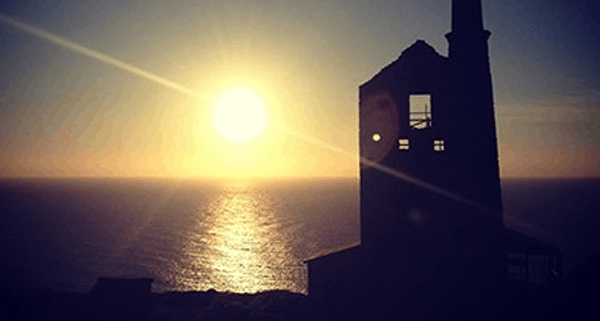 We also got to witness some great sunsets whilst filming on the coast at Botallack with the mine silhouetted in the background. Of course, I am really enjoying watching the series now it’s out on TV and seeing how everything has come together, being able to spot the different Cornish locations as well as the friends I made whilst filming. I’m really pleased with the reaction that Poldark has received so far and am excited that they have announced that a second series will be filmed at the end of the summer.